Literally the best keto fat bomb recipe around! I have to admit that one of the highlights of the keto diet are Keto fat bombs. Never heard of them? Keto Fat Bombs, also known as Keto fudge are one of the best Keto desserts you can find! You don’t even have to be following the Keto diet to enjoy these tasty treats. This low carb chocolate dessert is vegan friendly and gluten free. The one thing that can throw a wrench in eating healthy for me is feeling deprived! 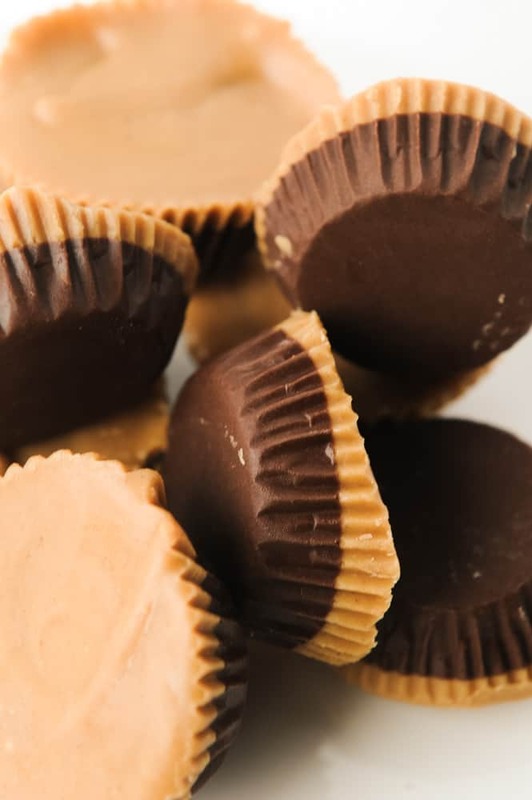 These chocolate peanut butter fat bombs are the trick to not feeling deprived! 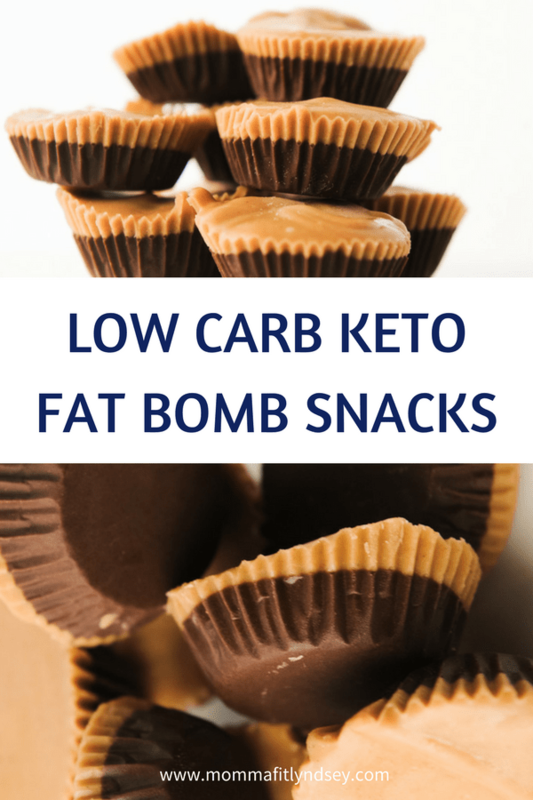 Keto fat bombs are high fat, low carb snacks. They are designed to give your body a healthy dose of fat needed to provide satiety and give you an energy source. For me, they are like dessert and keep me full and not wanting to snack on empty calories. If you’ve ever wondered if you would be hungry on the Keto diet, these Keto fat bomb recipes will do the trick! Keto fat bomb recipes have just a few ingredients. A healthy fat (i.e. coconut oil or nut butter), flavoring (i.e vanilla extract, stevia, cacao), and texture (i.e. almonds, coconut, seeds, etc). 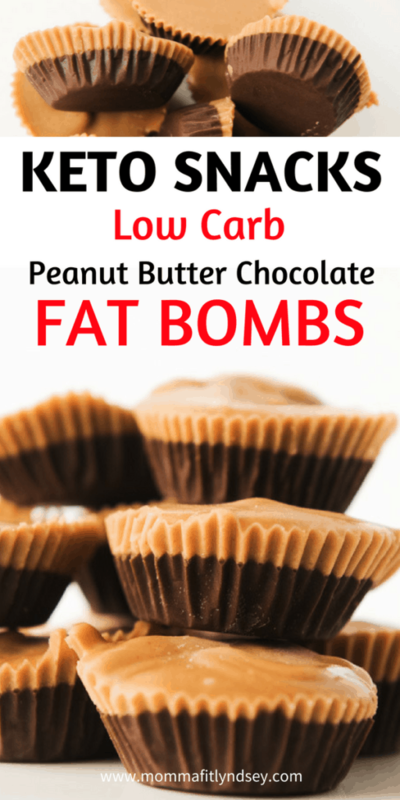 Note that the recipe I am going to share is a keto fat bomb recipe including peanuts. Peanuts are a controversial ingredient in diets such as Whole30 and Paleo. Even with the keto diet, there are some people who will not eat them. 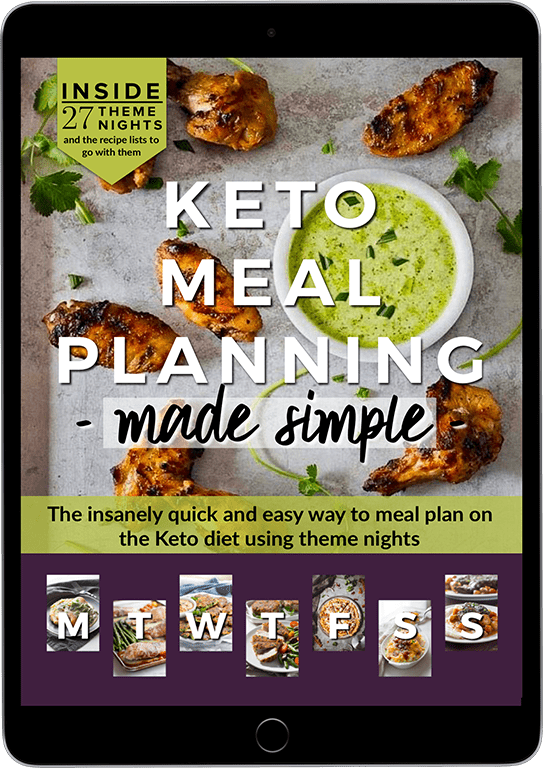 Need Help with Keto Meal Planning ? This will help! Peanuts are considered a legume and can cause inflammation in the gut which is why some people choose to forgo them. 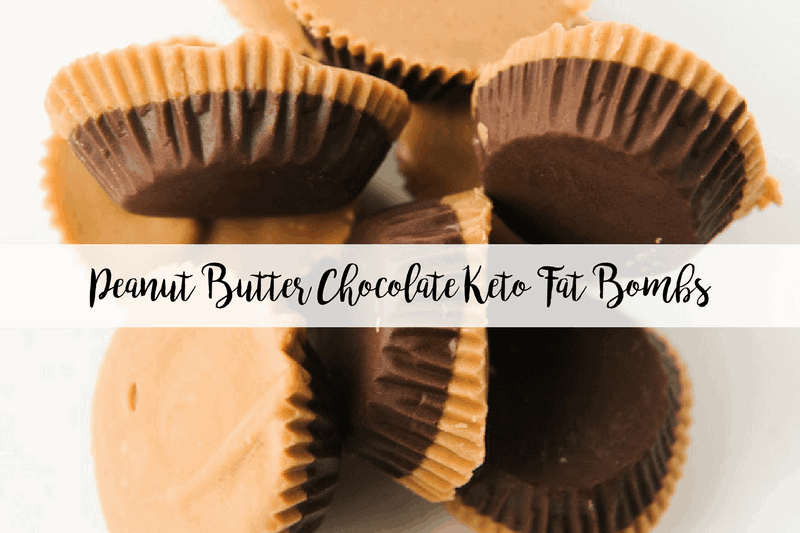 Although this keto fat bomb has peanuts, if they are an issue for you, just swap out for almond or another low-inflammation nut butter. Need help in getting started with the Keto Diet? 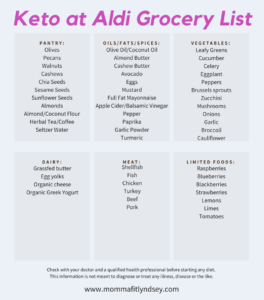 This article is a great resource for my top Keto Picks at Aldi to get you started on the Keto diet! Combine all ingredients from Chocolate layer. Stir until smooth. Fill mini muffin cups halfway. Freeze for 10 minutes. 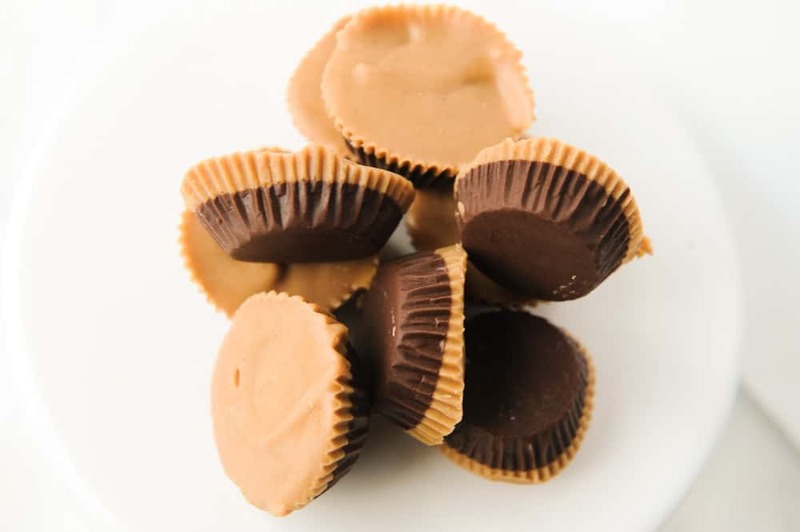 Combine all ingredients from peanut butter layer. Stir until smooth. Fill mini muffin cups the rest of the way. Store frozen. Makes approximately 12 small bombs. Have you tried out the keto diet yet? I’d love to hear your thoughts, or favorite recipes in the comments! these sound so good. I am afraid I would eat them all. they’re surprisingly filling! I like to keep mine in the freezer and just have one per day. Can you PLEASE provide macros? I get 1329 calories and 20 net carbs when i run the recipe through Carb Manager. For the stevia drops, what’s the conversion with regular granulated stevia? Can’t find the drops in my local store and I have SO MUCH granulated stevia on hand. Thanks for the intriguing recipe! I would love to share this recipe on my blog. These look delicious! I just found this. I don’t have liquid stevia either. When you say white powder do you mean the standard Stevia packets that you would use for tea or something? Yep! I would opt for grassfed but definitely give it a try! Is the conversion for butter & coconut oil equal or no? Also make I ask what the stevia extract is? I only have powdered and drops. stevia drops are the same. they should work great! and yes you can convert butter and coconut oil one for one melted! what kind of peanut butter did you use? you can use any natural peanut butter. check the sugar count to make sure it’s just peanuts, and doesn’t have added sugar. The cocoa is very overpowering! The kids will be getting this batch. If I makes these again, I will do with 1/4 of the amount above. definitely depends on your tastes for sure! I like a strong chocolate flavor but definitely dial down if you want a more mild flavor. Are the macros posted for eating all 12. So you would divide those numbers by 12 to get macros for 1 fat bomb. Or are the numbers per bomb? Could you tell me approx how many this makes? you do say to put them in little muffin papers, but don’t say how many? mini muffin papers? curious as to the macros per serving. scroll down for macro info! It’s listed at the end of the post. I used regular sized muffins and it made about 12. You could make mini ones too, it would just make more. Just take the total amount of the macros at the end of the post and divide by how many total you end up with. I did use a regular one and filled them halfway up. So they were minis for me but I did not make them in a mini pan since I didn’t have one. This is the second time I have made these–LOVE them! They are my favorite fat bomb. that is great to hear!!! thanks for letting me know and I’m glad you like them! I haven’t made them with the confectioner’s type! If you do use it, I would see what a powdered sugar to regular sugar calculation would be and then use that! Hi! I’m using mini muffin pan to make these but do I need to use muffin liners? I made them without and now I can’t get them out of the pan! I did use muffin liners. I would imagine they would be very hard to get out of the pan if they were frozen to it. Def recommend liners! love that they worked out for you even without the liners! If I use PB2 instead of PB what ratio would you recommend? Same as PB or would it be less/more? Generally I believe it’s 2 TB of PB2/one TB of water which is 1 TB of nut butter, correct? I cannot attest to the flavor of these though as I do think PB2 would dilute the peanut butter taste. If you try it, let me know how it goes! oh thats great to know! might be a good switch for another option. thanks for sharing! I’m concerned about the Carbs? 20 is a lot. How many carbs per piece? These look great! I do not like artificial sweetners, do you think they would be okay without the stevia? Oops I didn’t mean artificial I meant sugar substitutes. Just not a fan of the aftertaste. gotcha!! if you do try without a sweetener, let me know how it tastes! You may try Swerve too, it’s another keto-friendly sweetener that may work! Is there supposed to be nut butter in both the chocolate and nut butter layers? That’s how the recipe reads. nut butter is in both layers. You have nut better listed in both layers. I am interested in this recipie, I don’t see how I can print it, is there a link that I am not seeing? This one doesn’t have a printable link but I will add one asap! Is It 20 net carbs? These are so delicious!!. It is my evening sweet treat with a cup of tea. They have become a staple in my daily diet!! Thank you for posting this recipe. I make these with powder stevia. 1 1/8th of a tsp is enough. But I also used carob powder it is very satisfying. You cant eat too many. But you dont need to. They fill you up. Nice to have the combination of carob and peanut butter. I followed this but it only made 9 cups for me… Haven’t tried them yet, but they are in the freezer so I am excited. I had a really hard time getting the chocolate into the muffin papers as it was so sticky and just not coming off the bowl haha. maybe try spraying them with coconut oil spray next time! Hope you enjoy! Mine turned out super bitter. Too much cocoa or maybe the sweetener? I used the liquid Pyure. I couldn’t even eat them. I’ve never used liquid Pyure so I am not sure how it tastes. If you follow the directions to a T and they are still bitter I would use less cocoa powder. But definitely could be the liquid Pyure. If stored in the freezer how long to thaw before eating? I made these yesterday. Thanks so much, they are delicious! Shared it with my sister and noticed something missing today… didn’t you offer 1/4 cup Swerve instead of 1/4 tsp liquid Stevia?? I used Swerve confectioners sugar replacement. yep you can def use Swerve as a replacement if you prefer! To clarify, the chocolate layer also has peanut butter? I tried this with the coconut oil but I just am not a fan of coconut. So I was going to try it with just butter. You said the unsalted butter right? Also what’s the conversion between the drops and granular Swerve? Thank you!! butter would work great! My hubby is the same way, not a fan of coconut so I will make with butter sometimes. the granular swerve may make it grainy so I would use caution when using. Just make sure you stir well. The conversion chart says 3/8 tsp liquid stevia to 1 tsp Swerve. You may have to experiment to see where you want it!